The empowerment of women in our society and culture is a current issue. We are in a time of the emergence of the feminine and the power of the female. How women speak forward and move forward fearlessly into their lives and their communities. DramaDogs, a Theater Company and DogStar Theater Company are in collaboration; co-creating an innovative project which highlights women in roles regarding choice, introspection and transformation; women who play their significant part in the humanity of the world. 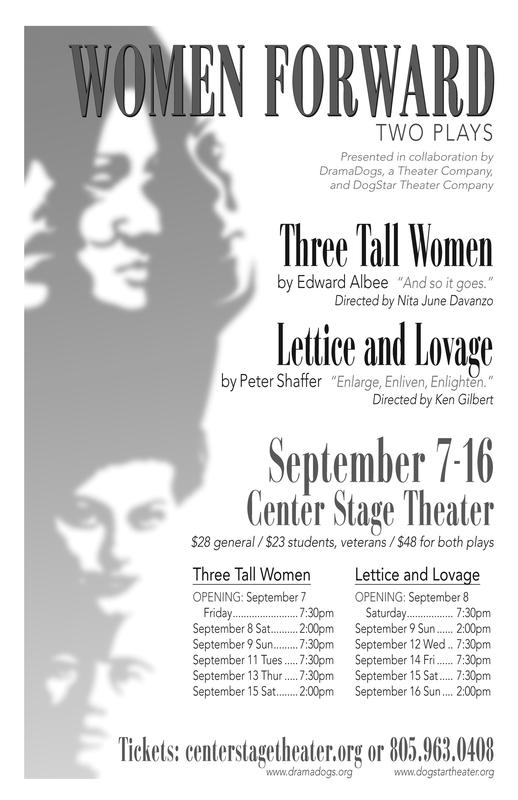 Come September, Three Tall Women by Edward Albee and Lettice and Lovage by Peter Shaffer will be brought to Center Stage, produced by DogStar and DramaDogs, respectively. Tickets can be purchased at www.centerstagetheater.org, $28 general / $23 students and veterans; special price $46 for both plays (you choose the performance dates at the time of purchase).